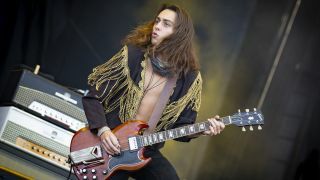 Greta Van Fleet’s Jake Kiszka: "I think the guitar still has a lot of evolving to do"
WORLD GUITAR DAY 2018: Anyone with a vague interest in rock music and a working Internet connection will have seen some sort of footage of Greta Van Fleet over the last few years, a young Michigan quartet with a Led Zeppelin-rivalling knack for heavy riffs, seismic mid-tempo grooves and skyscraping vocals. Despite being in their late teens/early 20s, the four members - comprised of the three Kiszka brothers and drummer Danny Wagner - possess a musical maturity that stretches far, far beyond their collective years. Those who feel rock is dead, or rapidly on its way to becoming obsolete, could learn a lot from the two EPs Greta Van Fleet have put out so far – and their debut album landing this October could very well have the final say on the matter. It’s World Guitar Day! What do you immediately think of when you hear the word ‘guitar’? I think the guitar still has a lot of evolving to do! Do you remember the moment you were first drawn to music? Was there one specific player that first inspired you on this journey? How much did switching to electric guitar change your playing? “Once I got my first electric, a Fender Squier, everything changed. I must have been in fourth grade and my teacher played us something from her generation, which was Jimi Hendrix’s Star Spangled Banner. That was another really critical moment where, despite never having heard it before, something really clicked, even though it seemed like most of the other kids didn’t really get it. But I felt I could understand it from all the traditional music I had heard growing up… I get goosebumps now just thinking about it. As for the mental health side of playing guitar, have there ever been moments where the instrument has picked you up when feeling down? “I was thinking about this just yesterday. I was watching an interview with Paul McCartney where he said the guitar, or any instrument, but especially the guitar is a tool of meditation. There’s a very transient quality when you are playing. So absolutely, there have been points in my life where I’ve felt depressed or confused or unhappy, and I’ve picked up the guitar to figure things out whenever I’ve felt like that. Like many of the 60s/70s legends like The Rolling Stones, Led Zeppelin or Free, your music weaves through both major and minor tonalities. Is that a conscious thing? “I was told it was fairly uncommon to go from minor to major. But it became this subconscious thing for me, because I’d write things like Edge Of Darkness which has verses that are in minor but when it hits the chorus it all goes into major, and same goes for the solo. It’s all about dichotomy of the two. “It’s almost like you learn more about yourself through the guitar you are playing. It’s not like you go out to find the guitar, it’s more like it finds you in one way or another – and that’s kinda what happened with me and that classic pair of brands. My dad would take me to the music shop and would tell me not to worry about what amp was what, he told me just to pay more attention to the quality of the tone and what I was hoping to hear. We spent a year or so trying to find my first amp and it ended up being a Marshall. After my first guitar, I ended up with an SG Standard with P90 pickups… I guess I was just drawn to the tonal qualities. What’s the story behind the ‘61 Les Paul you’ve used extensively on stage? “I was gifted that 61 Les Paul by the CEO of a music store called the Chicago Music Exchange. He invited me over when we were in Chicago and took me up into this room called The Vault, pulling out all these half million dollar guitars. Is there much in between your guitar and amp? “While we were making the album, there were quite a few pedals I used to diversify my sound. I have two Holy Grail reverbs – one to create the general reverb and another that sounds more like a spring being dropped, which is fun to toy around with. There’s a song we have called Brave New World that has this fuzzy, crackly tone that really overdrives the pre-amp where I used a Jext Telez Face. You’re just about to release your long-awaited debut album. What was the writing/recording process like and what can we expect from it? “There were quite a few objectives in making this album. For the most part, we wanted to try and build on what we’d previously released… I think we achieved that. From touring consistently and playing every night, there’s been this evolution of skill level that we might not have been conscious of. It’s hard to identify with, but people that caught us at one show and then four months later have told us they’ve seen a lot of growth – which adds this whole existential perspective on this album. We’ve become better musicians and more studio-savvy, as well as better songwriters. We’ve added to the diversity of our sound as we’ve grown – which was one of the objectives.